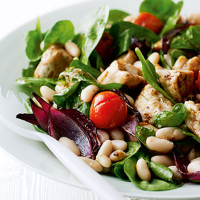 This low fat, filling salad is full of gutsy flavours. Chicken, tomatoes and onion are roasted in a hot oven for sweetness, then dressed while still warm. Preheat the oven to 200°C, gas mark 6. Place the chicken in a small roasting tin with the onion and mist lightly with the olive oil spray. Sprinkle with the rosemary, season and mix well to evenly coat the chicken. Place in the oven and roast for 20-25 minutes until the chicken is thoroughly cooked. Drizzle with the balsamic glaze, stir and return to the oven for a further 5 minutes. Put the tomatoes in a small ovenproof dish and spray with a little oil. Place in the oven for the last 10-15 minutes of the chicken’s cooking time until they start to burst. Remove the chicken and tomatoes from the oven, then allow to stand for 5 minutes before tipping into a large serving bowl with the spinach and beans. Make the dressing by whisking together all the ingredients. Drizzle over the salad and toss well. Serve immediately with chunks of warm Waitrose granary baguette. Canned beans are a convenient and nutritious store cupboard standby. Beans are low in fat and a good source of protein. Try this recipe with other canned beans such as flageolet or butter beans. Alternatively use dried beans, which should be soaked overnight and cooked according to pack instructions.